KUALA LUMPUR: Hua Yang Bhd has acquired 1.55 acres of prime land in Desa Pandan Commercial Centre. It plans to develop the land into a mixed serviced apartment and commercial centre with a gross development value of RM160mil. “This is part of our strategy to expand our operations in the Klang Valley with our developments in Sungai Besi, Selayang and now, Kuala Lumpur City Centre,” said CEO Ho Wen Yan in a statement yesterday. For developments in the Klang Valley, he said the company's strategy was to develop vertical communities in the form of high-rise apartments, complete with a retail space for the convenience of residents. Property developer IGB Corporation Bhd has allocated up to RM3 billion for various assets acquisitions overseas this year, said managing director, Robert C M Tan. He said the acquisitions comprising mixed developments, including hotels in Europe and the United States, was in line with the company's expansion plan. "We always look for deals and that's how we grow," he told reporters after the company's annual general meeting here today. 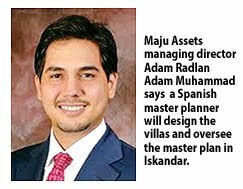 KUALA LUMPUR: Maju Assets Sdn Bhd, the property arm of Maju Holdings Sdn Bhd aims to launch a RM4 billion high-end project, primarily for the expatriate community in Iskandar Malaysia, Johor. It is also planning a beach fronting expatriate village in Terengganu for RM200 million, its managing director Adam Radlan Adam Muhammad said. For the 480-hectare project in Iskandar, it is in the planning stage and will be launched in two to three years, Radlan said. Radlan said the the catalyst development will be a 18-hole golf course over 120ha. He said what would make the development appealing are the specially-designed Spanish villas. Radlan added that the pricing for the villas will start from US$300,000 (RM897,000). "We are getting Emiliano Armani, a Spanish master planner to design the villas. He will oversee the master plan," Radlan said in an interview with Business Times recently. The project, which has yet to be named and located in Ulu Tiram, will include semi-detached homes, link houses and a marina equestrian centre. "The timing is right for this project. The government is pumping in money in Iskandar Malaysia and it has attracted foreign parties. Our immediate market will be Singaporeans," he said. Three times the size of Singapore, Iskandar Malaysia spans 2,217 sq km and is a mixed use development planned for completion in 2025. The government is targeting investments of US$110 billion (RM329 billion). For the project in Terenganu, Radlan said the company is targeting players in the oil and gas sector. The gated community will have villas and serviced apartments, for long-term lease to foreigners. Radlan said with the award of contracts by Petroliam Nasional Bhd, he expects more expats to live in Terengganu. "We are talking to Esso, Talisman and Murphy Oil to lease the units when the project is ready," he said. According to Radlan, this will be the first of its kind project in Malaysia. The properties will feature modern living with a touch of traditional Malay architecture, preserving the heritage.